With its signature integrated coverage of theory, diagnosis, and treatment, and inclusive cross-cultural perspective, this new edition of Comer’s widely adopted textbook shows students where the study and treatment of psychological disorders stand today. In addition to a thorough updating, the new edition integrates the developmental psychopathology perspective to integrates the explanations and treatments for psychological disorders offered by the various models; updates coverage of biological models to include new research on brain circuits; and combines behavioral and cognitive explanations and treatments for psychological disorders into a coherent and nuanced cognitive-behavioral model. 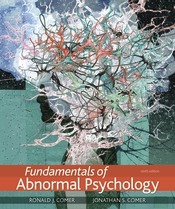 Comer/Comer’s Fundamentals of Abnormal Psychology, 9e employs some extraordinary interactive tools to bring students face to face with the realities of psychological dysfunction, organized for easy access and assignability in LaunchPad, Worth Publishers’ online course space.